Web Globalization: Does Your Site Support Arabic, Hebrew, Albanian, Hindi, Persian, Malaysian, Azeri, and Mongolian Languages? 1. Linguistic support reflects economic opportunity. Online GDP is a good predictor for overall levels of use. Companies offer languages for some large and/or developed economies – such as Simplified Chinese, Spanish, German, Japanese, French, and most of the tongues of the European Union. 2. Other languages underperform significantly. This list includes Arabic, which has almost 300 million speakers and provides access to 3% of world online GDP, but appears online less than a language like Romanian, with 24 million speakers and less than 0.2% of online GDP. 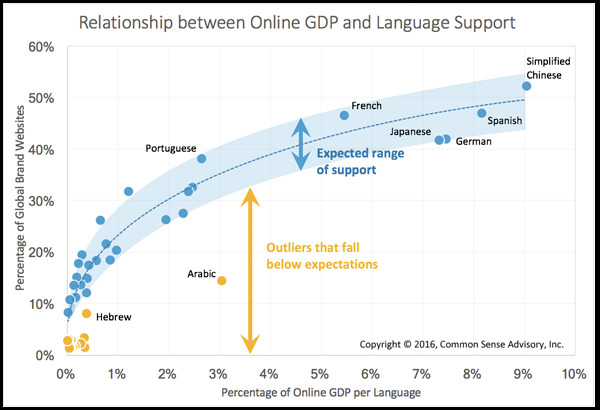 Other languages that significantly underperform include Hindi, Persian, Hebrew, and Malaysian, all of which have far lower support than we would expect based on their economic potential. This view excludes English, which is the source or go-to language for over 98% of global brands that support more than one language. - Some languages pose technical difficulties. Although support has improved, bidirectional languages such as Arabic and Hebrew and complex scripts, like Devanagari (used for Hindi) or the Nastaliq writing style used in Urdu, are still seen as difficult to handle. - Membership has its advantages. Inclusion as an official language of a European Union member state gives an automatic boost. This group systematically outperforms even other European ones – such as Bosnian, Macedonian, Basque, or Catalan – that may have more speakers or more GDP. The leading tongues are also ones that CEOs tend to recognize, while many of the ones that lag are less familiar. - Politics matter. Languages spoken in politically troubled or fragmented regions pay a support penalty. It is easy to address a tongue – such as German, Japanese, Chinese, or Dutch – that is dominant in one or a few countries. However, if the language is used in many countries – such as Arabic, which is official in 27 countries – it becomes more difficult: Enterprises have to face the legal and regulatory hurdles that each country imposes. Underperforming tongues pose a challenge for enterprises − they are difficult to address effectively, but for those that do, they create an opportunity to gain market share free from competition. Although they tend to be smaller, the localization market is seeing a dramatic shift toward the “long tail” of languages as companies such as Facebook, Ericcson, MediaTek, Nokia, Opera, Samsung, and Qualcomm invest in bringing internet access to those markets, with similar efforts from Google and SpaceX also on the table. Enterprises that are aware of the chance for growth they offer can better tune their localization strategy to their economic potential. Our brief on this topic provides information on the support level for the top 49 online languages and can help guide you to these hidden opportunities. The Broadband Commission for Digital Development, an organization established six years ago to monitor the growth and use of the Internet around the world, released its 2015 report on the state of broadband. The report argues that representation of the world's languages online remains one of the major challenges in expanding the Internet to reach the four billion people who don’t yet have access. At the moment, the Internet only has webpages in about five percent of the world's languages. Even national languages like Hindi and Swahili are used on only .01 percent of the 10 million most popular websites. The majority of the world’s languages lack an online presence that is actually useful. One such under-resourced language is Chichewa, a Bantu language spoken by 12 million people, many of whom are in the country of Malawi. According to Edmond Kachale, a programmer who began developing a basic word processor for the language in 2005 and has been working on translating Google search into Chichewa for the last five years, his language doesn’t have sufficient content online. This makes it difficult for its speakers to compete in a digital, globalized world. UNESCO has designated Aymara as “vulnerable.” Beginning in May of 2014, a group of 20 volunteer translators have been chipping away at the 25,000 words used on the site—and the project is on course to be finished by Christmas.